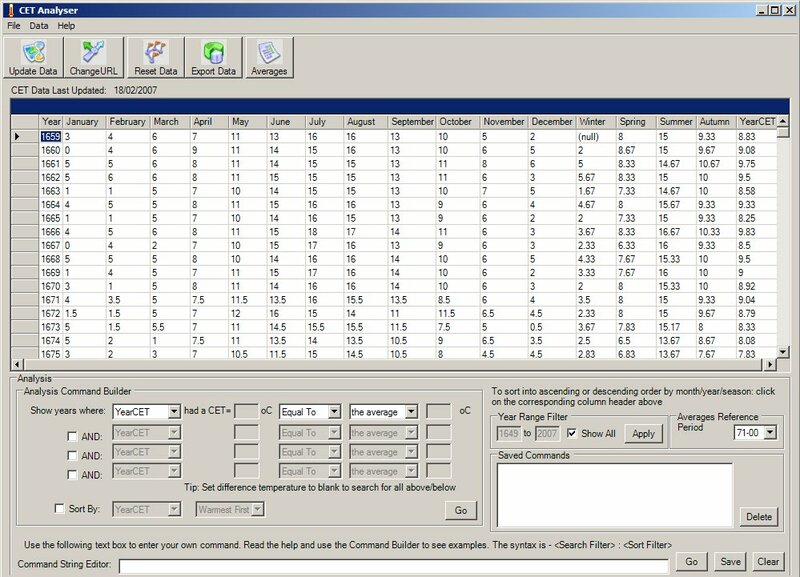 A statistical weather tool used to analyse Central England Temperature data provided by the Met Office. The CET is the worlds longest running weather dataset going back to 1659 which provides the monthly average temperature for an triangular area roughly Sheffield, London & Bristol. From this data, tends and patterns can be examined - important in the current global warming phase. 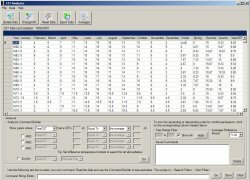 CET Analyser will download the latest CET data and provide this in a grid that can be manipulated in a variety of ways to allow patterns to be spotted. The data can then be exported into MS Excel for graphing. You will require Microsoft .NET framework version 2 installed which you can get from Windows Update. Then download the zip file from this page, extract this zip and run the installer file. Follow the on screen instructions. You should first update your dataset by pressing the 'Update Data' button. Instructions on using the application can be found in the help system, accessed by going to 'Help' menu then selecting 'Help'.